Last week I was busy with life and totally forgot to join in on Wednesday's Walk with Christmas Memories. You see I have a very special friend who recently found out that she has stage 4 cancer that has settled in her liver and other organs. I have been walking down Memory Lane, re-living special times that I have had with my special friend over the past 34 years of our friendship. Here is a picture of my friend Myrna from when we went to lunch one time for her birthday at the Rib Crib. We always celebrate special times together. So, this Christmas is hard to think of it being our last Christmas together. I really can't stand the thought of not having her in my life, BUT... I know she is a Christian, and that she will soon be face to face with Jesus...and that makes me happy for her. 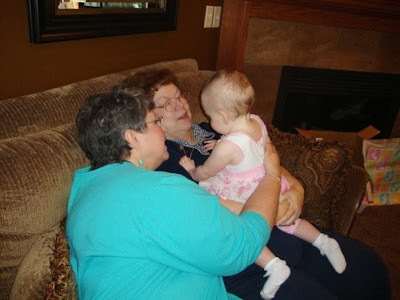 Myrna's husband went to heaven 7 years ago and she has missed him so much! She will get to see him soon too...and that will be wonderful for her. Here is a wedding picture of Myrna and her husband Lonie. 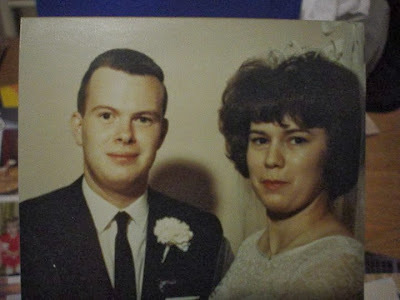 They were married for 40 years. Myrna asked me if there was something that she had that I might like to have to remember her by...and I couldn't think of anything. She has given me so much over the 34 years of our friendship. I just told her that I would treasure her family...and be there for them. After all, she is so much like a sister to me...and that makes me Auntie Linda to her kids and grandkids. Christmas is all about love...and we do need to remember to share Christ's love with others. This is something Myrna has done for many years! She has always helped people and loved them...and displayed the love of God in her everyday living. She is one of the kindest people I know. As a matter of fact...the fruits of the Spirit flow from her so easily. And isn't that how we all should be...especially at Christmas time. Here is an article that I wrote for the local newspaper when my special friend opened a new antique store a few years back. Many years ago Myrna had a resale shop and that is how I met her...and we just hit it off so well, and we became fast friends! Myrna's illness came on so quickly and we really haven't had time to adjust. This morning she asked me if I would be able to speak at her funeral. I told her that I don't think I would be able to get through it because we are so very close. But my husband said if I write it out, he will read it for me. I pray that God will give me the strength to even put all of my feelings down on paper, so that I can honor my special friend. Please pray for all of us as we go through this very hard thing. The picture above is from the day Myrna was leaving the hospital to be moved to a care facility. My three daughters and three of my granddaughters went with me to see Myrna and she was just leaving so we all walked down to the parking garage with her and one of Myrna's daughter's Jill and Jill's young friend. 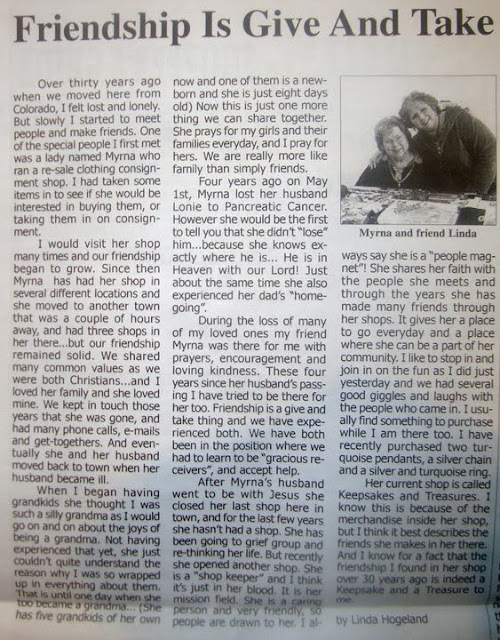 Through all of this that Myrna is going through she has remained peaceful, and she is still gentle and kind and she is still concerned for everyone around her. 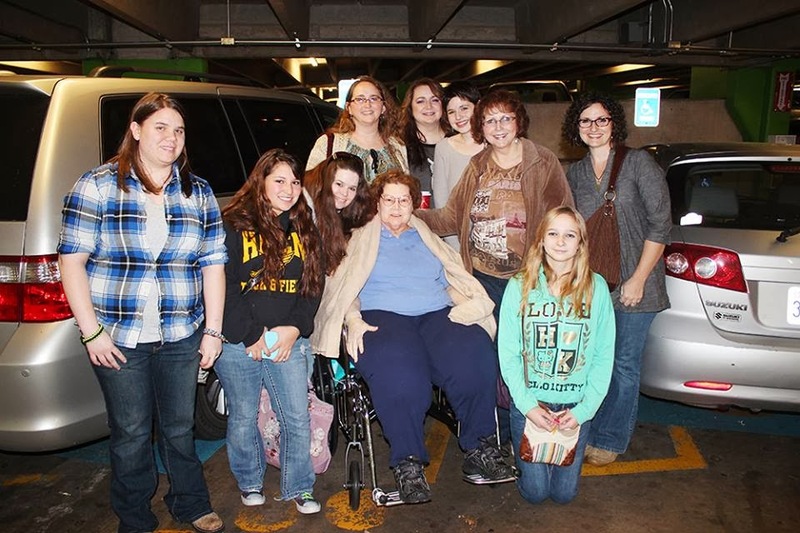 She now has 7 grandkids and they have been visiting her in the care facility. Myrna is going to do Christmas with them there this Saturday and Sunday. I know this will be a "bittersweet" gathering. I pray that God will give them all strength and peace as they go through this last Christmas together. what a precious post about your friend. I will be praying for her and for you during this time. What wonderful memories you have and such an incredible blessing in her friendship. Thanks for sharing her with us this week! Oh what a blessing to have such an amazing friend. Also what an amazing example on how to live ones life. Love it. I'll be praying for you, your family as well as hers. Thank you for sharing about her. She sounds like an amazing lady!! Thinking about you during this time. May God give you all the strength you need and comfort. What a wonderful friendship. So thankful to know she will be with her dear husband again and that one day you will be with her too ! Nothing like the assurance of Jesus. Will pray for your dear friend as she walks this road . . .
Oh Linda, my heart breaks for your friend, and for you. I pray that God will hold you close during this time. What a beautiful tribute. Thanks for sharing it. The two of you have a special friendship. My prayers are with you in the days ahead that you'll find strength and comfort.